France, Alsace-Lorraine under German Occupation during the Franco-Prussian war, 1870, 5 centimes yellow-green, BACKGROUND NETWORK WITH POINTS DOWN, unused no gum, small invisible paper restauration on reverse. 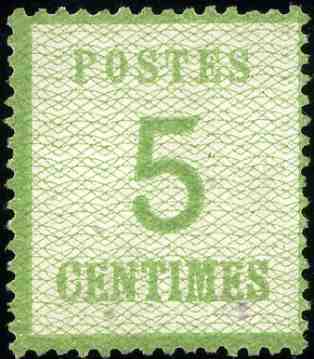 A beautiful example of this great rarity of which according to the Dallay catalogue ONLY 10 UNUSED COPIES EXIST and as such it is one of the rarest stamps of France. 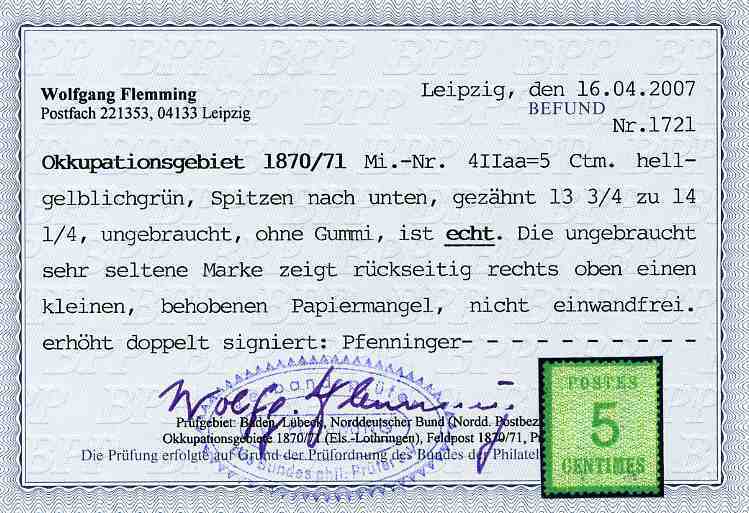 Signed by the expert Pfenninger, certificate Flemming BPP. Scott N11, Michel 4 II aa, Yvert 4b = 8050 EUR, Dallay 4a = 8000 EUR.